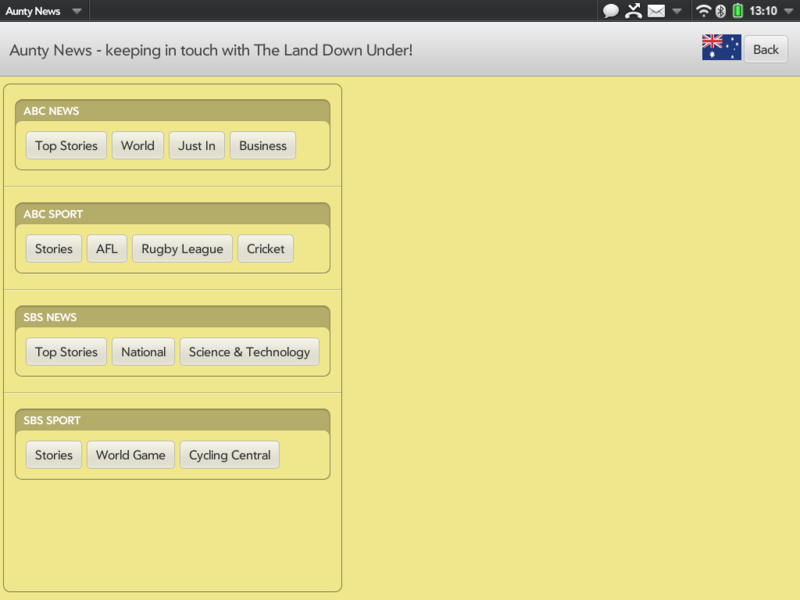 RSS newsreader for Australian news including sports. Feeds are from ABC and SBS; clink links to go to orginal site pages. 0.0.7 Web/site page view works for webos 2.2 also. State News now added. 0.0.6 NEW FEATURE - this MultiPack app now has a working webos 2.1 version. The webos 3.0.2 version for the TouchPad is rearranged to show feed buttons vertically and give more room for feeds. More feed buttons are now possible, eg State News. Removed button scroller. 0.0.5 The news sources can now be scrolled around so more room is provided for feeds list. On a Pre 3 you can now see the feeds but the links going to site pages do not display yet.